I will be the first to admit, I don't usually like change. I know, I know, change is good. Change is growth. And usually, even though I might not like it, I try to embrace it and go with it. But sometimes, change elicits anxiety, worry and a little FREAKING out on my end. I may or may not have passed this trait to my eldest- Sophia. Bless her heart. She is like me in so many ways, the bad and good. And she is with me on the whole change thing. Sophia was the one kid who at the end of her Kindergarten year was actually bummed out. She didn't want to leave Kindergarten or her teacher. Don't let the smiles fool you- when talking to her about going to 1st grade, she still gets all gloomy and sad. She's always been a- dip her toe in before jumping in- kind of gal- she takes after my own heart. Saidey- on the other hand- jumps first and then thinks about it. With two ends of the spectrum, I've found that either way, there are some things I can do to ease them both into change. Now, with this, there is a certain balance you have to find here. I've found that sometimes you can actually invoke MORE anxiety by preparing TOO far ahead of time, so you have to find the right time. Kids have a hard time with the concept of time so starting to prep them for an event or change occurring far into the future can actually backfire on you (trust- me I've got personal experience). You live and learn, right?! When we decided that Sophia would do KidsWest this Summer and Fall, we planted the seed when we decided by asking her thoughts on it. After that, we didn't speak anything of it until a few weeks before Summer break. We talked about not going to Audra's anymore and that she would instead, go to KidsWest. For Saidey, we started talking about her "new" school. So, now that you've started talking about the change, you can start preparing for the change. We do this in a couple of ways and depending on the type of change. Some helpful tips are to take them to the new place (childcare, school, house, etc). We toured Saidey's new child care center with her and this time we weren't able to but if you can, ask the child care provider if you can spend an afternoon there with your kiddo to ease the transition, too. For Sophia- we drove to the building she would be spending the Summer in. If I was thinking ahead, I would have also requested information about the staff, so she knew their names, too. Sometimes, visuals are so helpful! Showing pictures of a house, building or school are helpful in that they provide the children with a tangible visual surrounding the change. My sister recently moved to Chicago and so when explaining her move, we showed Sophia where Chicago is on a map. If and whenever we decide to move, we will show the girls pictures of the new house. When transitioning to the unfamiliar, sometimes bringing something familiar eases change and transition, too. Depending on your kiddo's disposition, a comfort item may be helpful. Whether it's a favorite blanket or stuffed animal or even a picture, these items can significantly ease the uncomfortableness that can be change. Lastly, routine is so important. Quite often, change disrupts our normal routines. Getting back into a routine as quickly as possible can help ease the change, too. Prepping kids by sharing what that routine is and then following it (obviously allowing for flexibility, too) helps them regain consistency and assurance that things will be ok.
End of Day 1 of a new child care center and school age summer program was a SUCCESS! So, there ya have it! 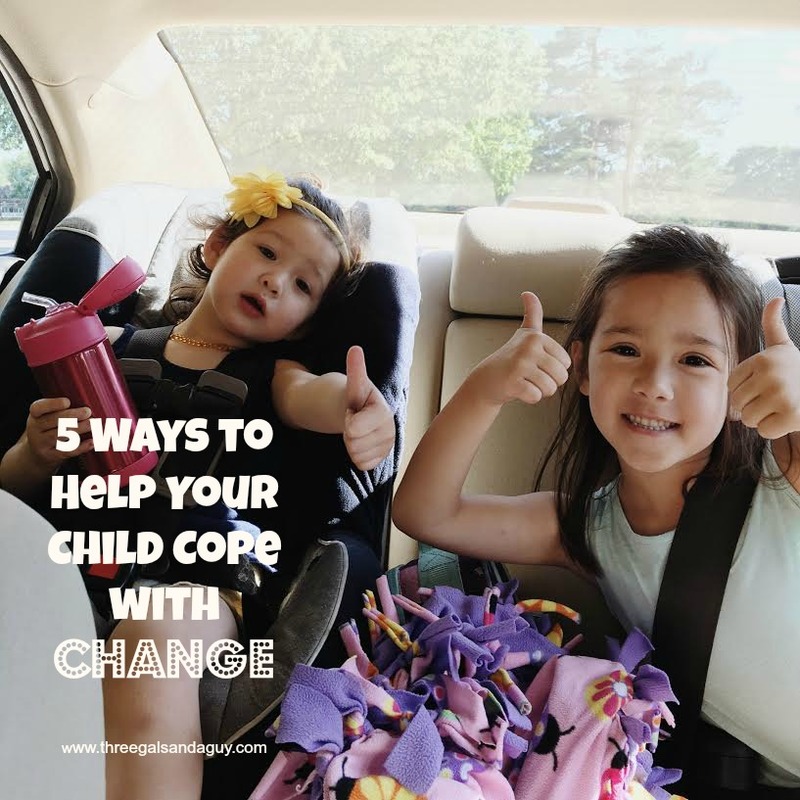 My 5 tips for helping your kiddos' cope with change. What would you add?